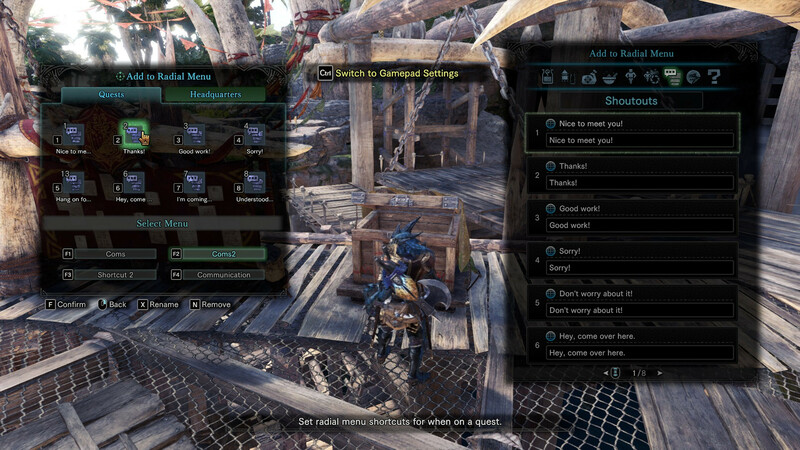 Loadouts in Monster Hunter World (MHW) allow a Hunter to store configurations of Items and Equipment. They can be used to quickly prepare for any situation. Both Item and Equipment Loadouts can be equipped at any Item Box or Campsite tent. 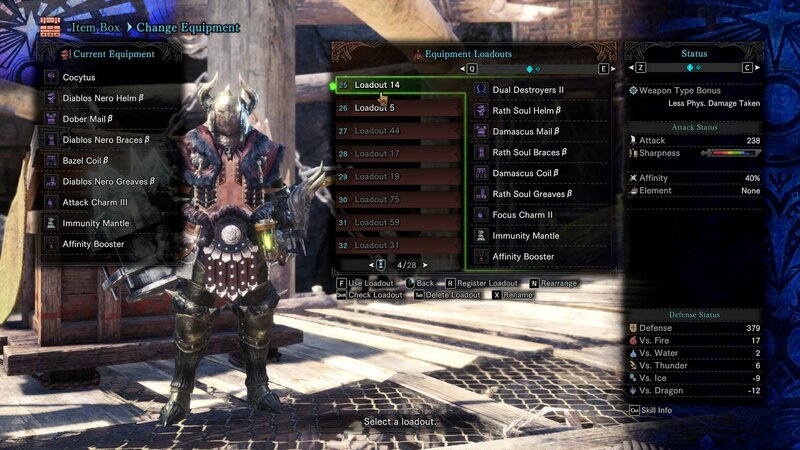 To browse Equipment Loadouts that other Hunters have shared, see Builds. 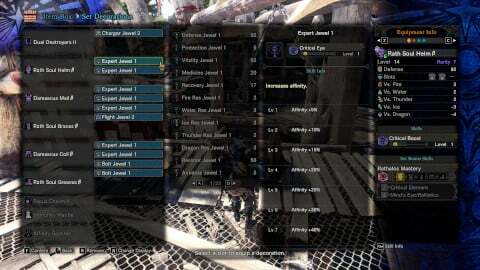 For details on how Equipment performs in combat with Monsters, see Weapons, Weapon Mechanics, Defense, and Elemental Resistance. For information on improving your Weapons and Armor, see Augmentations and Upgrades. 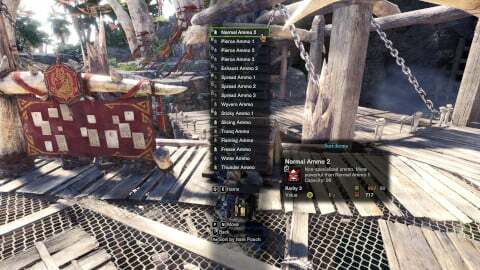 Item Loadouts store the contents of the Hunter's Item Pouch, including the Ammo/Coatings portion and its exact arrangement. The arrangements of the Item Pouch, Item Bar, and Ammo Bar can be managed independently of each other. The configuration of the Radial Menu is also stored. 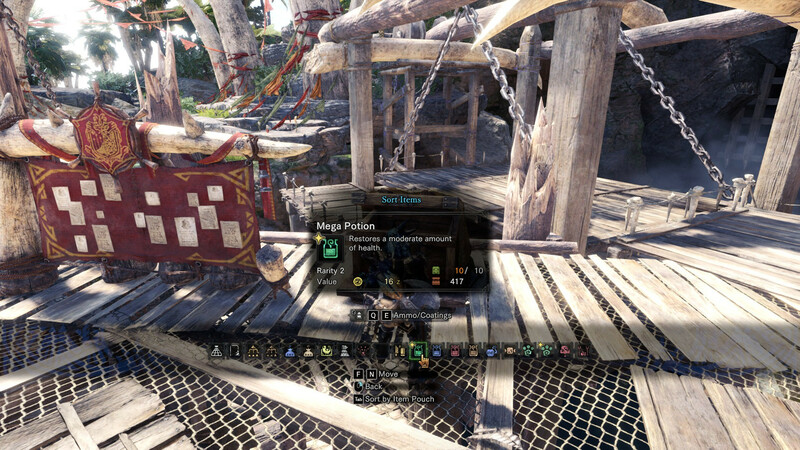 While viewing the Item Pouch via the Item Box or the Start Menu's Items and Equipment tab, the Item Bar can be viewed with Triangle/Y/Spc, and the Ammo/Coatings Bar can be viewed with L1,R1/L1,R1/Q,E while the Item Bar is open. Slots in the Pouch/Bars can be rearranged with Square/X/Shift. While viewing the Radial Menu from the Start Menu's Items and Equipment tab, entries can be selected from Items, Ammo/Coatings, Special Equipment, Crafting, Gestures, Shoutouts, Stickers, and Other (Signal, SOS Flare.) Portions of the Radial Menu can be renamed with Options/Menu/Esc. The Radial Menu can be used to quickly craft Items from spare materials brought along in the Item Pouch. This allows a Hunter to restock Ammo/Coatings or recovery Items. When Ammo is crafted from a completely depleted stock, it is placed at the bottom of the Ammo bar. For this reason, it may be useful to place one's most heavily used Ammo toward the bottom, keeping it all close to hand after running out. When an Item Loadout is reloaded, Ammo will move back to its original position in the Ammo Bar. If one wants to change an element shared by all of their Item Loadouts, they will have to load and resave each one individually. Making a fully configured Loadout before saving too many variations will help avoid this problem. 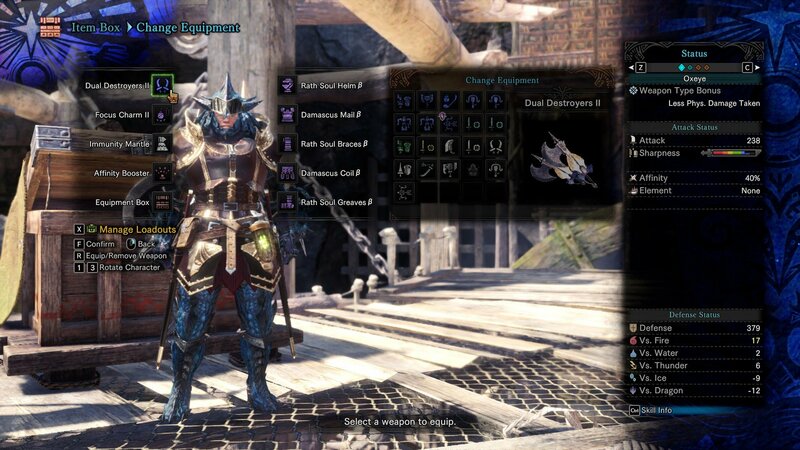 Equipment Loadouts store the Hunter's Weapon, Armor pieces, Charm, and Specialized Equipment, along with thier installed Pigments, Decorations, Augments, and Bowgun Modifications, where applicable. 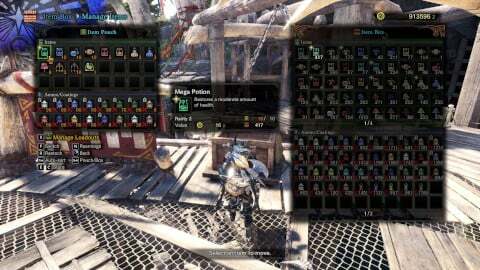 The exact Weapon/Armor piece will be stored even with duplicates available in storage. Additionally, Pigments, Decorations, Augments, and Bowgun Modifications will be dynamically reinstalled to a Weapon/Armor Piece whenever it is required by a Loadout. 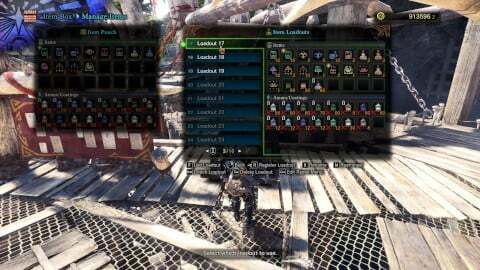 Layered Armor pieces are not stored. While viewing the Change Equipment Menu from the Item Box or Smithy, Armor pieces, Specialized Equipment, a Weapon and a Charm can be chosen from storage. While viewing Set Decorations from the Item Box or Smithy, Decorations can be chosen from storage or from current installments. Weapon Augments and Bowgun Modifications can be installed at the Smithy.